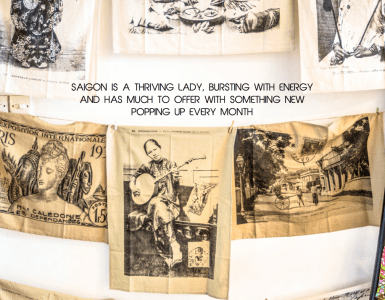 From cool rooftop bars and frenetic markets to the haunting war museum, Saigon is a friendly and fascinating city, writes Kate Wickers We held hands tightly. This was our third attempt to cross the road and, again, we jumped back to the curb shrieking as the traffic skimmed by. Ben, my 15-year-old son, had an idea. “Let’s follow them,” he said, pointing to a group of local Saigonese. We stuck to our unsuspecting guardians like glue. 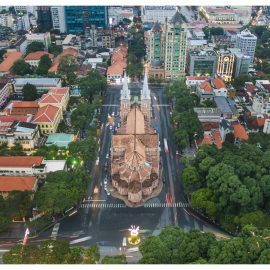 It was 23 years since I last visited Ho Chi Minh City, known locally as Saigon, and the pace of life had certainly quickened. We were staying at the gorgeous Hotel des Arts, a trailblazer for a new breed of boutique-style luxury hotels. It is styled in French colonial chic. The suites have freestanding baths in marbled bathrooms, which have floor to ceiling views over the city (too high up to flash the neighbours). In the public lounges there are antiques and artwork from leading Vietnamese artists. All are for sale bar one – Vu Cao Dam’s painting of Divinite is placed strategically to watch over the hotel. Breakfast is lavish in Saigon Kitchen (freshly made pancakes, French pastries, Willy Wonka smoothies of dragon fruit and pomelo), which we walked off en route to the mixed-faith Jade Emperor Pagoda, built in 1909. You won’t hear a reverential whisper here – it’s a 24-hour non-stop hive of boisterous Buddhist and Taoist bustle. I didn’t have the right amount of change for my son Freddie, aged 11, to buy incense so a local lady, with a wide gappy smile and no English, stepped in to pay for his sticks. I was instantly reminded of the warmth of the Vietnamese people. The huge incense coils that hang from the smoke-stained ceiling made our eyes stream as Freddie joined the throng of worshippers who jostled to leave offerings of food; waft incense and pay their respects to the Emperor. Ben Thanh Market still thrives, chock-full with goodies from fake designer gear to enamelled bowls made from coconut husks, to papayas the size of rugby balls. My sons discussed footie with the fake Rolex sellers as they negotiated a deal, while I stocked up on loose leaf lotus tea (a local speciality) and haggled over jade earrings. The smell of fresh mint wafted from Phung Kau food stall in the heart of the market so we pulled up tiny plastic stools and ordered Banh Khoai, juicy rice flour wraps packed with noodles, prawn, onion leaf and mint that cost just £2.50 for five. On weekends Hotel des Arts’ Social Club (rooftop bar and pool) teems with a cool set, who come to pose and enjoy a cocktail with a view over to the futuristic Skydeck – the lotus-shaped viewing platform of the Bitexco Financial Tower, Saigon’s tallest building. Weekdays it is tranquil – a lovely place to while away the hottest hours of the day away from the frenetic streets below. The quietest hour to visit The War Remnants Museum is just before closing, from 4pm-5pm, and with kids in tow this is probably enough time to brood over the brutality of the Vietnam War. There’s a huge collection of uncensored photographs (including those of the infamous My Lai Massacre); propaganda posters; weapons and torture instruments. The inhumane ‘tiger cages’ where Viet Cong prisoners were held are beyond disturbing. For dinner Temple Club is wonderfully atmospheric, full of polished lacquer furniture, opium-den screens, orange pumpkin lanterns and original Art Deco (don’t miss the ornate wood-panelled loos). It’s tucked away, along a candle-lit alley, on the first floor of a pretty heritage mansion and feels like a secret. Try the seabass steamed in a clay pot and the coconut prawns. For post-dinner drinks the roof top bar of The Rex Hotel, once the drinking hole of war correspondents and foreign journalists, is a great people-watching spot. We ordered Saigon Green beers and perched on stools to gaze down on the statue of Uncle Ho, who stands in front of the handsome old Hotel de Ville. From here we took a leisurely stroll past the Opera House, Notre Dame Cathedral, The Post Office, The People’s Committee Office and The Reunification Palace – all moodily lit by night. The humble cyclo (bicycle rickshaw) was once the only way to be transported around Saigon but numbers have dwindled as the motorised traffic has increased. We threw caution to the carbon monoxide wind and took a fleet out to Ho Ki Thi flower market. Florists live and work in this clutch of narrow alleyways and it’s a lovely area to explore. Not to be missed is “Rose Street”, where blooms of every shade are packed tightly in to corrugated cardboard cylinders. Look for the great sprays of woven palms laced with shocking pink orchids; the huge bouquets of golden chrysanthemums (a symbol for sorrow) and the delicate pink lotus flower buds, just waiting to burst forth. For lunch pop in to colourful Propaganda, which dishes up street food classics. The décor is the real attraction though with walls plastered with retro Communist posters and huge murals. Water puppetry (a little like Punch and Judy in a swimming pool) originates from north Vietnam, where over 1,000 years ago rice farmers used their paddy fields as a stage. We sat in the ‘splash zone’ at the front of The Golden Dragon Theatre, to watch the puppets walk on water (they are actually attached to poles but the illusion is clever). Fire-breathing dragons and buffalo leap in time to the pluck of the traditional dan bau (monochord) and the pipe of a bamboo flute. For lunch pop in to colourful Propaganda, which dishes up street food classics. The décor is the real attraction though with walls plastered with retro Communist posters and huge murals. Water puppetry (a little like Punch and Judy in a swimming pool) originates from north Vietnam, where over 1,000 years ago rice farmers used their paddy fields as a stage. We sat in the ‘splash zone’ at the front of The Golden Dragon Theatre, to watch the puppets walk on water (they are actually attached to poles but the illusion is clever). Fire-breathing dragons and buffalo leap in time to the pluck of the traditional dan bau (monochord) and the pipe of a bamboo flute. A day trip into the Mekong Delta is within easy reach of Saigon. We went with Gingko Voyage Tours and Jun, our guide, kept up a fascinating constant oratory on Vietnamese history, including his own family story. We took a ride on a motorboat, with fierce red eyes painted on the bow to ward off evil spirits, along the mighty Mekong, which flows 2,703 miles from the Tibetan plateau, along the Mekong delta into the South China Sea. When we reached smaller tributaries ladies in conical hats were waiting to punt us along in sampans (small flat-bottomed boats). The environment is idyllic with little green bee-eaters and kingfishers flitting along the banks and fishermen casting river nets, eagerly watched by canny purple heron. We lunched at a restaurant by the river, under a canopy of palms, feasting on fried banana flowers followed by elephant ear fish (or gourami), a local Mekong river fish, which our host wrapped in rice paper with glass noodles, pineapple and morning glory. Jun took us on a bike ride along narrow riverside lanes and rural dirt tracks (eyes to the ground for potholes and buffalo poo), stopping en route at a small brick factory, where beautiful kilns, like giant copper-coloured beehives, are hand built to fire the hand cut bricks. 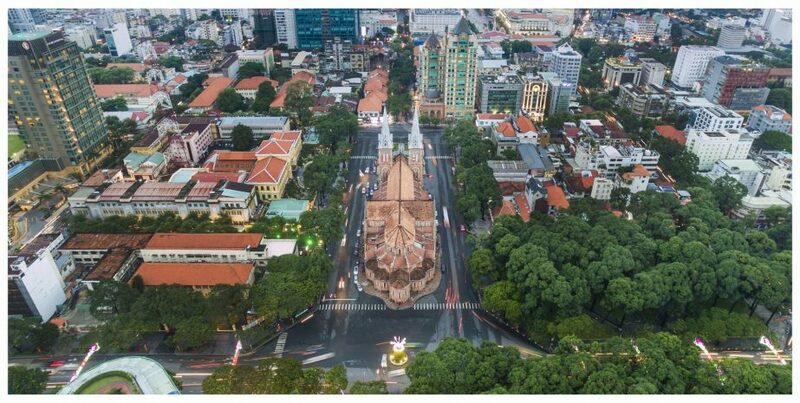 Tourism may have boomed in Vietnam but the authenticity and charm of Saigon survives and in many ways has improved. Bloom restaurant, which stands for ‘Because Love Overcomes One’s Misfortune’, is a great example of this. Run by the non-profit ACWP (Aid to Children Without Parents) it gives vocational training to disadvantaged Vietnamese youths. Housed in a colonial villa, it’s a quirky place with guests seated in individual rooms, each painted a striking hue. The food is top-notch (local dishes with a contemporary edge) and the service is touchingly enthusiastic. My heart of palm salad with prawns and pork was heavenly, but the smile that it was served with was even more divine. Fact box Vietnam Airlines (www.vietnamairlines.com) flies nonstop three times a week to Ho Chi Minh City (Saigon) and four times a week to Hanoi from London Heathrow. Adult fares from £462. Double rooms at Hotel des Arts start at £170, including breakfast, based on two people sharing. 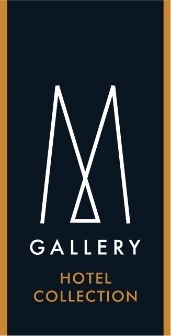 Go to www.hoteldesartssaigon.com for the latest offers.